Lowongan Kerja PT Bank Pembangunan Daerah Jawa Timur Tbk - PT Bank Jatim Tbk or later known as Bank Jatim is a rapidly expanding regional development bank in Indonesia. Based in Surabaya East Java, the regional development bank is owned together by the Government of East Java Province and the cities/regencies of East Java. 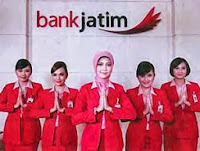 Bank Jatim was founded in 1961 and went public in 2012. Bank Jatim's shares were listed on the stock market (IDX) under ticker code BJTM. As of December 2014, Bank Jatim has 40 conventional branches, 3 sharia branches, 148 conventional sub branches, 164 cash offices, 47 sharia service offices, 5 sharia sub branch offices, 165 cash offices, 97 sharia service offices, 167 payment points, 62 cash outlets, 6 mobile ATM units, 2 cash deposit machines (CDM) and 595 ATMs. In terms of financial positions, Bank Jatim has recorded a good performance in 2014. Net profit recorded as Rp 939.08 billion. This reflected an 13.92% increase from Rp 824.31 billion in 2013. Male, with maximum age of 25 years old (for fresh graduate) and 27 years old (for experienced) as of 31 July 2015. Minimum Bachelor Degree (S1) in Economic, Law, and Engineering. Minimum GPA of 2.75 (PTN) and 3.00 (PTS) with minimum accredited "B". Previous experience in the field of banking or finance will be highly prioritized. Willing not to get married during not appointed as a permanent employee. Have no family relationship with the employee of Bank Jatim up to the second degree. Minimum Bachelor Degree (S1) in Economic, Law, Engineering, and Sharia Economic. Minimum Bachelor Degree (S1) in Accounting. Minimum GPA of 2.75 (PTN) and 3.00 (PTS) with minimum accredited "A". Previous experience in the field of Accounting, Banking or Finance will be highly prioritized. Minimum Bachelor Degree (S1) in Computer Engineering, Informatics Engineering, Information System, and Electronics. Excellent skills inn programming languange and development cycle (SDLC) will be highly prioritized. Strong knowledge and good understanding about troubleshooting (computer and networking) will be an advantage.